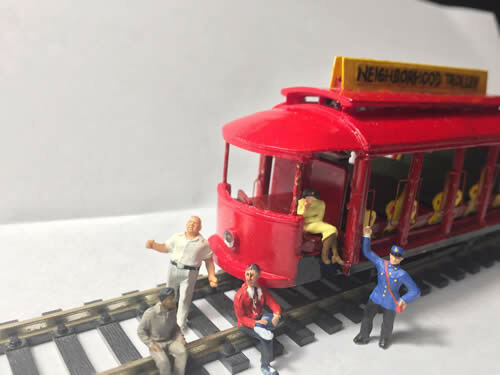 I remember reading an article about the neighborhood Trolley found in the opening sequence of Mr. Rogers’ Neighborhood in Model Railroader sometime during the 1980s or 1990s. 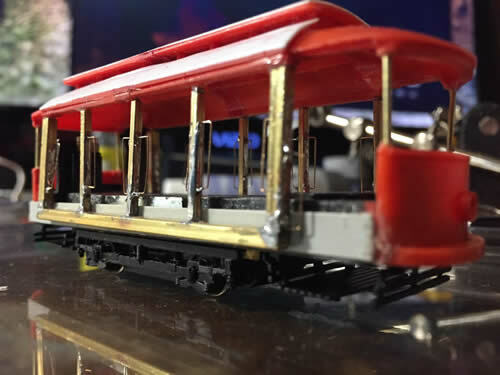 I thought it would be neat to have one of my own, but lacked the skill to do it at the time, and the technology was not such that the trolley would be operational ... 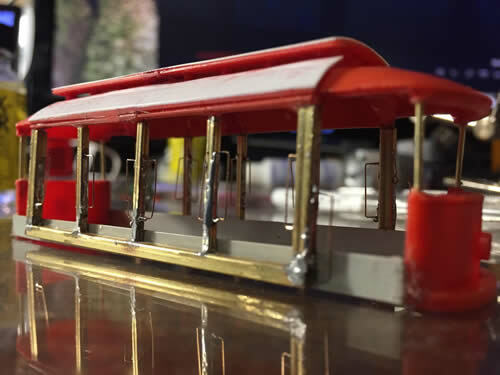 I wanted mine to be operational, and I wanted to have a true open trolley to match the look of the original, much larger trolley that took us all to make believe and back. 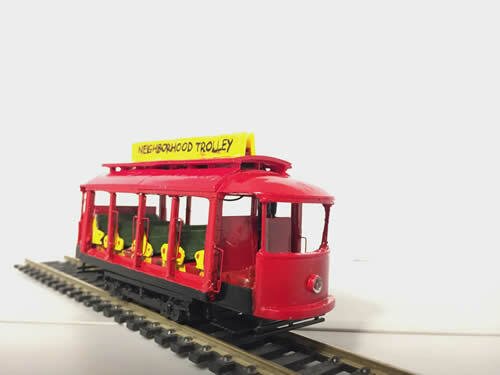 I thought the Tyco Broadway Trolley looked something of the part at first, and I found one relatively cheaply on ebay. Then I had to hunt for a suitable chassis and drive, which I eventually found in a Birney Safety Car by Bachmann Spectrum. The Birney chassis was ideal because it was flat, having been designed to accommodate interior details such as seats on top. 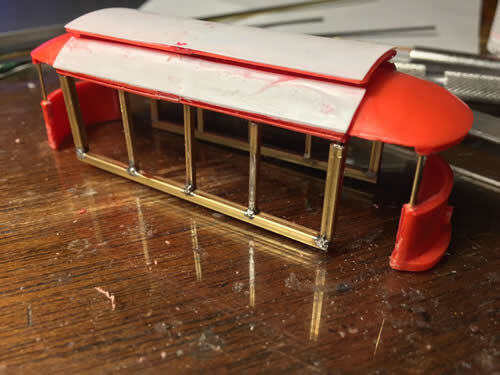 I eventually cut the sides and pillars off of the broadway completely, leaving only the curved ends and the roof, which I shortened by cutting about 1/4” from the middle. 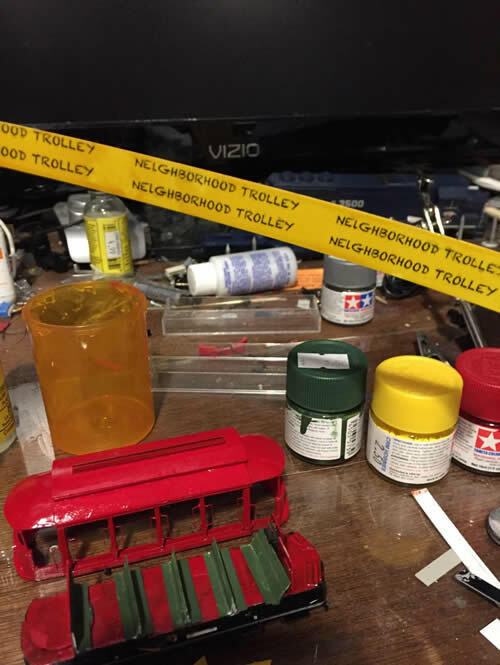 I built new sides and end columns for the trolley using brass materials from the K&S bin at the local hobby shop and seats using Plastruct styrene. I painted it, added LED lighting, and installed a KAM4 decoder from TCS.